(Newser) – A New York woman convicted of killing her infant daughter in the 1980s and suspected of killing seven of her eight other children was granted parole, per the AP. State Department of Corrections and Community Supervision officials said Marybeth Tinning, 75, could be released from prison as early as next month. Her release from a Westchester County prison was approved last week after a parole hearing, her seventh since being imprisoned in 1987, officials said in a statement. A jury convicted the Schenectady resident of killing her ninth child, 4-month-old Tami Lynne, in December 1985. She was one of Marybeth and Joseph Tinning's eight young children to die between 1972 and 1985 under suspicious circumstances. Authorities believe the couple's first child died of natural causes. Marybeth Tinning was convicted of murder in 1987 for smothering Tami Lynne. Three of the Marybeth and Joseph Tinning's three children died within a two-month span in early 1972. Authorities determined the infant girl died from acute meningitis and didn't consider her death suspicious. 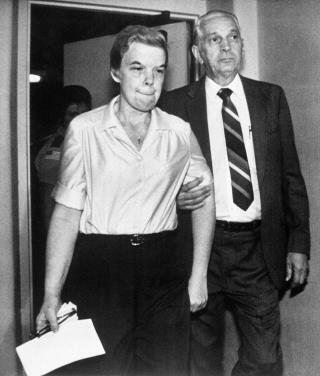 Marybeth Tinning attributed the other two deaths to seizures. Investigators looked into the death of the 4-year-old but dropped the case after doctors attributed his death to cardiac arrest. The fourth child's death just two weeks after birth in 1973 was attributed to sudden infant death syndrome. The death in 1975 of a 5-month-old boy was attributed after an autopsy to acute pulmonary edema. His death was followed four years later by that of a 3-month-old girl, who was said to have died of SIDS. The cause of death of a 3-month-old son in 1980 was undetermined, while the 1981 death of a 3-year-old boy the couple was in the process of adopting was blamed on bronchial pneumonia. Maybe she is O.K. and then again maybe not but we can test her by letting her out. It's an election year in NY so Andy will ensure that murderers, cop killers and rapists can roam our streets again.